Multiple Sclerosis (MS) is thought to be an autoimmune disease that affects the brain and spinal cord. White blood cells, which are part of the body’s immune system normally fight infection. In MS, these white blood cells become mis-programmed and attack the brain and spinal cord. The axons are part of a neuron (nerve cell) and are used to transmit information to other nerve cells. The main target of this immune attack in MS is the myelin covering over an axon. Therefore MS is often referred to as a demyelinating disease. The myelin coating of an axon is analogous to rubber insulation over an electrical wire, and efficient electrical transmission requires intact myelin. Damage to the nerves and their myelin coating causes the neurological symptoms that affect people with MS. Neurological signs typical for MS include symptoms of weakness, numbness, tingling, dizziness, and blurred or double vision. The majority of patients with MS experience relapses or attacks, caused by waves of white blood cells attacking the brain or spinal cord. Some patients experience irreversible or progressive symptoms. MS usually starts in patients 20 to 30 years of age, however it has become increasingly recognized that MS occurs in children and teenagers. MS affects approximately 400,000 people in the United States. Current estimates suggest that about 5% of all MS cases start in childhood or adolescence. Children with MS experience many of the same symptoms that adults do, however because of age differences may not recognize these symptoms as readily. We have also found that children can expererience more frequent relapses than adults. There is evidence that treatment with immunomodulatory agents for MS is safe and effective in children. Care of a child or adolescent with MS requires a multidisciplinary team, which includes evaluation by a neurologist, as well as neuropsychologist and other caregivers. When you visit the Partners Pediatric MS Center, your MS doctor will help to decide which treatment is best for you or your child. In addition, supportive services such as physical therapy, psychological support and educational support will be important in your child’s long-term care plan. Our goal is to work with you child and your family to find the best way to manage your child’s condition. Relapsing-remitting MS is the most common form of MS, and over 90% of children with MS are affected by this subtype. Relapsing-remitting MS follows a pattern in which the patient develops signs and symptoms of a neurological disturbance in the brain or spinal cord. The relapses progress over a few days, stabilize, and typically resolve after a few weeks. 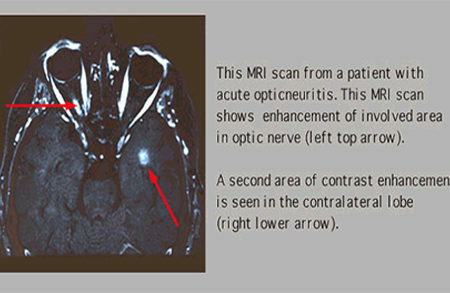 Optic neuritis is a common presenting symptom of multiple sclerosis. As a result patients may complain of pain with eye movement and decreased vision in the affected eye. Other common symptoms include double vision, numbness and tingling, and parents may observe slurred speech, limb weakness, clumsiness, imbalance as well as bowel and bladder symptoms. These symptoms can completely resolve or one may remain with a partial deficit. Additional symptoms common to patients with MS include fatigue, heat intolerance, depression, and spasticity. Children can be affected by one or more of these symptoms. Younger children in particular may not readily recognize these symptoms as abnormal, which could lead to delays in diagnosis. Over time, a relapsing-remitting disease course could convert to a secondary progressive course in which symptoms do not remit or go away. The ultimate goal of therapies in MS is to prevent progressive disability. There is increasing evidence showing that children develop progression slower than adults, however this may vary from patient to patient. A rare variant of MS called neuromyelitis optica which predominantly affects the optic nerves and spinal cord can present in children. Your doctor will help to identify the subtype of MS and decide on the best treatments. 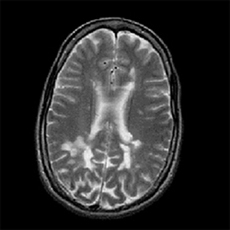 The diagnosis of MS in children is based on clinical attacks and MRI evidence of typical lesions. The International Pediatric MS Study Group has published consensus criteria which help to guide clinicians in diagnosis of MS in children and adolescents (see Neurology Journal supplement, April 2008). MRI imaging of the brain and spinal cord is a valuable tool to establish an early diagnosis and monitor disease progression. MRIs are relatively safe tests which image the brain and the spinal cord. 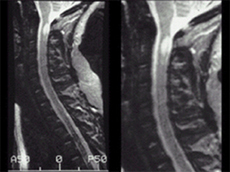 The MRI pictures shown in figure 1 demonstrate areas of demyelination (plaques) in the cervical spinal cord and in the brain (figure 2). Infusion with a dye called gadolinium may reveal enhancement which indicates that the lesions are “active” (figure 3). Additional testing may be required to establish the diagnosis of MS. Lumbar punctures are performed to sample the cerebral spinal fluid (CSF) and to examine it for evidence of inflammation. 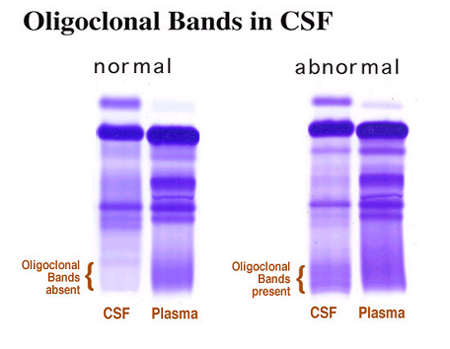 We also look for the presence of oligoclonal bands (figure 4) or an elevation of a test called the IgG index which shows that an immune reaction is taking place in the brain. 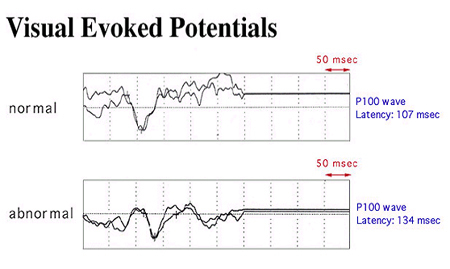 Visual evoked potentials may be obtained to examine if there is evidence of previous damage to the optic nerve from a demyelinating event (figure 5). At times, brainstem auditory evoked potentials or somatosensory evoked potential are obtained to examine other information pathways in the brain. 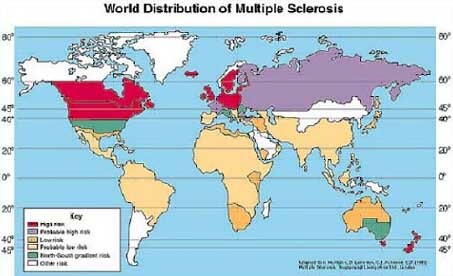 In adults, the prevalence of MS is highest in North America, Northern Europe and Southern Australia. There is a complex pattern of prevalence within these areas (figure 6). In North America, the highest rate is in Southern Canada and in the Northern United States. The lowest rate in North America is the Mississippi region and surrounding southeastern states. Studies have indicated that early life residence influences the risk of developing MS. The worldwide prevalence and distribution of MS in children is currently unknown, however large international studies are underway. Cases of MS in children have been reported from countries all over the world, including USA, Canada, Argentina, UK, France, Italy, Sweden, Germany, Austria, Russia, Thailand, India, Japan and Korea. MS is considered to be an immune mediated disease. This concept is supported by the fact that all current therapies for MS target different functions of the immune system. Only very few cells of the immune system are normally found in the brain, but in MS activated cells of the immune system can infiltrate the white matter (figure 7) where most of the myelin is located (the grey matter is where most of the neurons are found). The migration of immune cells into the brain is blocked by the Beta-interferon drugs as well as one of the new therapies, Natalizumab (Tysabri). Natalizumab is an antibody binds to a surface protein on cells of the immune system and blocks their binding to blood vessels of the brain, the first step required for their entry into the white matter. Two populations of immune cells are particularly important, B cells and T cells. B cells produce antibodies that can bind to myelin and thereby damage the myelin sheath. Recent preliminary trials with Rituximab (Rituxan) have shown that depletion of B cells reduces new lesions in MS, showing that B cells are important. 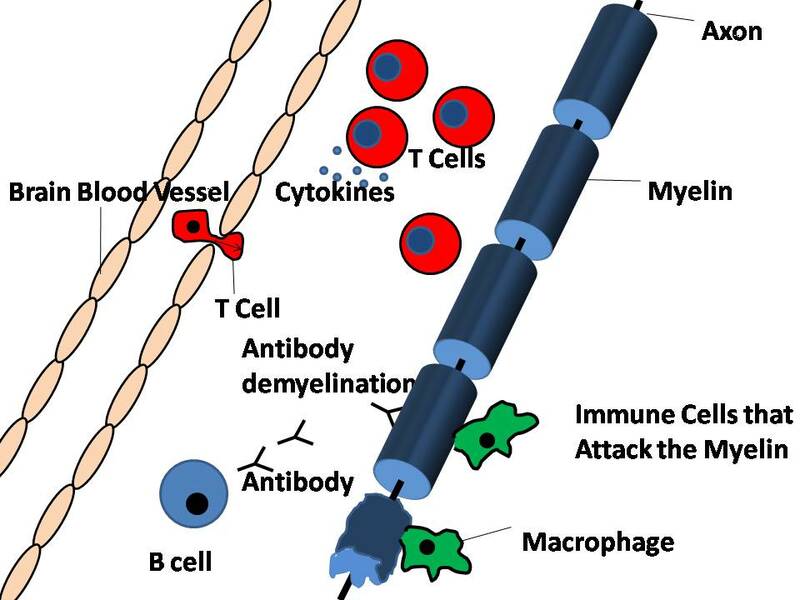 T cells are a second kind of immune cell that is important in MS. T cells produce proteins that attract other immune cell populations (cytokines), thereby causing inflammation. Macrophages are also involved because they take up large chunks of damaged myelin, thereby contributing to demyelination. One of the main goals of treatment is to block inflammatory cells from damaging the brain and spinal cord. Not all cells of the immune system are detrimental in MS. Regulatory T cells can inhibit other immune cell populations and thereby reduce inflammation. Such cells are induced by another therapy called Glatiramer Acetate (Copaxone). Studies are underway to understand the differences and similarities between the immune response in children and adults with MS, which may have important implications for treatment. Acute disseminated encephalomyelitis (ADEM): ADEM can occur in both adults and children, although it is more common in children. ADEM generally appears after a viral illness, or rarely after vaccination. The symptoms of ADEM can resemble an MS attack, although ADEM usually does not recur. There are some recurrent or multiphasic forms of ADEM, which in some cases can be difficult to distinguish from MS. The relationship between ADEM and MS is not well understood, and in approximately 15-20% of cases, patients with ADEM may develop MS later in life. The initial treatment of ADEM often includes steroids and supportive care. Other immunomodulatory agents such as IVIG may be used in refractory cases. Optic neuritis refers to an inflammatory demyelinating attack on the optic nerves. Symptoms can include blurred or loss of vision as well as eye pain. 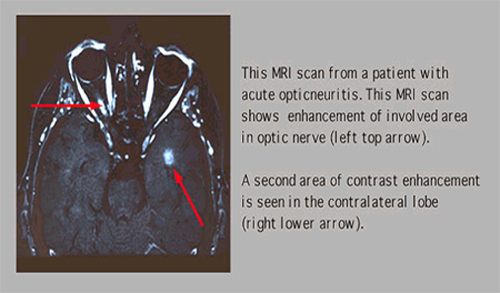 Optic neuritis can occur in MS patients, or can occur in isolation. In some cases a first attack of optic neuritis may lead to the development of MS later in life. Steroid treatments are often used to reduce the symptoms of optic neuritis. Transverse myelitis is an inflammatory demyelinating attack on the spinal cord. Symptoms include back pain, leg weakness and bowel and bladder dysfunction. Transverse myelitis can occur in MS patients, or can occur in isolation. In some cases, a first attack of transverse myelitis may lead to the development of MS later in life. The initial treatment for transverse myelitis is intravenous steroids, however other immunodulatory agents may be used in refractory cases. The Partners Pediatric MS Center has several ongoing research studies, and is also involved in large national and international research efforts to understand why MS and other demyelinating disorders occur in children and how these disorders are interrelated. In addition, we are trying to understand how MS in children is similar to or different from adult MS. This is important, because we need to understand whether the same or different treatments should be used. To find out more about our research programs, visit our research page .